Note lengths are important in music: a note can be played (very) short, (very) long and everything in between. You can measure note lengths in number of beats; but this can also be in fractions of a beat. But, what is exactly a beat? 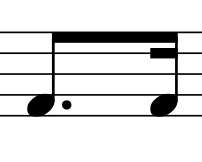 A beat could be defined as the basic rhythmic unit in music. When you clap your hands or tap your toes when you listen to a piece of music, you do that normally on every beat. Some basic note lengths (or note values) are the whole note, the half note and the quarter note. You can see them displayed in the staff below. The whole note has a duration of 4 beats. In 4/4 time, this corresponds to a whole measure, from where ‘whole note’ has its name. The duration of a half tone is half of that of a whole tone, so 2 beats. And, logically, a quarter note has a duration of 1 beat. Listen to a sound sample of the whole note, half note and 2 quarter notes as in the staff above. The metronome clicks every beat. You will hear the metronome count 4 beats before it starts. Remark: whole note and half note have nothing to do with whole tone and half tone. The first 2 are durations, the last 2 are intervals. The stem of a note (the little vertical bar) can be pointed upwards (as in our previous examples), but also downwards. Generally spoken, the stem is upwards for notes in the lower half of the staff, and downwards in the upper half. See the next figure for an example. A sixteenths note is again half as long as an eighth note. You can have 4 sixteenths notes in one beat. Look at the next combination of quarter notes, eighth notes and sixteenths notes and listen to the corresponding sound sample. The metronome starts with 4 beats before it begins. 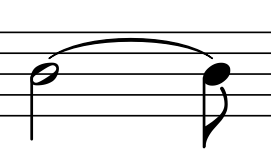 By adding extra flags to the stem (little vertical bar on the note), we can make thirty-second notes (8 in a beat), sixty-fourth notes (16 in a beat), etcetera. Example: look at the next combination of notes and listen to the corresponding sound sample. As always, the metronome starts with 4 beats before it begins. Please let us know what you think of this lesson by leaving a comment below.